Gabapentin is thought to be absorbed from the intestine of humans and animals by a low-capacity solute transporter localized in the upper small intestine. Saturation of this transporter at doses used clinically leads to dose-dependent pharmacokinetics and high interpatient variability, potentially resulting in suboptimal drug exposure in some patients. XP13512 [(±)-1-([(α-isobutanoyloxyethoxy)carbonyl] aminomethyl)-1-cyclohexane acetic acid] is a novel prodrug of gabapentin designed to be absorbed throughout the intestine by high-capacity nutrient transporters. XP13512 was stable at physiological pH but rapidly converted to gabapentin in intestinal and liver tissue from rats, dogs, monkeys, and humans. XP13512 was not a substrate or inhibitor of major cytochrome P450 isoforms in transfected baculosomes or liver homogenates. The separated isomers of XP13512 showed similar cleavage in human tissues. The prodrug demonstrated active apical to basolateral transport across Caco-2 cell monolayers and pH-dependent passive permeability across artificial membranes. XP13512 inhibited uptake of 14C-lactate by human embryonic kidney cells expressing monocarboxylate transporter type-1, and direct uptake of prodrug by these cells was confirmed using liquid chromatography-tandem mass spectrometry. XP13512 inhibited uptake of 3H-biotin into Chinese hamster ovary cells overexpressing human sodium-dependent multivitamin transporter (SMVT). Specific transport by SMVT was confirmed by oocyte electrophysiology studies and direct uptake studies in human embryonic kidney cells after tetracycline-induced expression of SMVT. XP13512 is therefore a substrate for several high-capacity absorption pathways present throughout the intestine. Therefore, administration of the prodrug should result in improved gabapentin bioavailability, dose proportionality, and colonic absorption compared with administration of gabapentin. Gabapentin (Fig. 1) is a structural analog of GABA currently marketed in the United States for treatment of epilepsy (McLean, 1999) and postherpetic neuralgia (Rowbotham et al., 1998; Rice and Maton, 2001) under the brand name Neurontin. The drug has also shown efficacy in the treatment of a variety of additional indications, including restless legs syndrome (Garcia-Borreguero et al., 2002), anxiety disorders (Pollack et al., 1998), hot flashes (Guttuso et al., 2003), diabetic neuropathy (Backonja et al., 1998), and other painful neuropathies. The clinical pharmacokinetics of gabapentin have been studied in healthy volunteers and patients with epilepsy (McLean, 1995; Gidal et al., 1998, 2000; Boyd et al., 1999). The structures of gabapentin (1), XP13512 (2), and gabapentin lactam (3). Gabapentin bioavailability is dose-dependent, decreasing from an average of about 60% at a 300-mg dose to about 35% or less at doses used to treat neuropathic pain. The underlying mechanism of this dose dependence is thought to be saturation of gabapentin absorption from the intestine. Gabapentin is absorbed by a low-capacity solute transporter localized in the upper small intestine, possibly an l-type amino acid transporter (Stewart et al., 1993; Uchino et al., 2002). The absorption pathway for gabapentin in human intestine can be saturated at doses that are used to treat neuropathic pain. As a result, plasma levels of gabapentin are unpredictable and may not reach therapeutically useful levels in some patients (Gidal et al., 2000). It has been reported recently that exposure to gabapentin at high oral doses increased in a linear manner (Berry et al., 2003). However, this study was based on limited data from less than 10 subjects, only four of which reached the highest dose of 4800 mg/day. Several larger clinical studies have clearly demonstrated the lack of dose proportionality for oral gabapentin (Gidal et al., 1998; Neurontin Summary Basis of Approval, NDA 20-235, U.S. Food And Drug Administration). The large interpatient differences in plasma gabapentin exposure observed clinically are likely the result of highly variable intestinal expression of the gabapentin transporter between individuals and the narrow localization of the transporter in the small intestine. A subset of patients appears to have limited ability to absorb gabapentin, possibly due to a lower abundance of the transporter in their intestines. This phenomenon may contribute to the relatively high incidence of nonresponders to Neurontin therapy reported in clinical trials (Backonja et al., 1998; Rice and Maton, 2001). Following oral absorption, gabapentin is rapidly excreted in the urine with a half-life of approximately 5 to 7 h. As a result, gabapentin must be administered three or four times per day to maintain therapeutic levels. It has been shown that dosing regimens requiring three or four doses per day lead to significant noncompliance in epilepsy patients (Richter et al., 2003). To date, efforts to develop a sustained release formulation of gabapentin have failed, primarily due to the lack of significant absorption of the drug in the large intestine (Kriel et al., 1997). XP13512 (Fig. 1) is a novel prodrug of gabapentin designed to overcome the pharmacokinetic limitations of gabapentin. The prodrug was engineered to be recognized as a substrate by two high-capacity nutrient transporters that are broadly distributed in the intestinal tract of humans. The first of these transporters, monocarboxylate transporter type 1 (MCT-1), is expressed along the length of the intestine and is responsible for the absorption of small-chain fatty acids derived from the diet or produced by intestinal microflora (Enerson and Drewes, 2003; Halestrap and Price, 1999). It has a high transport capacity, although its affinity for substrates is relatively low. The second, the sodium-dependent multivitamin transporter (SMVT), is also expressed in both the small and large intestine. SMVT is responsible for absorption of the essential cofactors biotin, lipoate, and pantothenate (Wang et al., 1999). Although its transport capacity may not be as high as that of MCT-1, it recognizes substrates with higher affinity (Prasad et al., 1999a). XP13512 was further designed to undergo efficient enzymatic hydrolysis to gabapentin in tissues encountered after absorption, with the release of nontoxic breakdown products. A series of related acyloxyalkylcarbamate compounds were synthesized, and the ultimate choice of XP13512 as the lead candidate was based on cumulative information on physicochemical properties, enzymatic stability, transport, and in vivo pharmacokinetics. The purpose of the current work was to evaluate in vitro the metabolism and transport properties of XP13512 in comparison with gabapentin. A companion manuscript describes the effect of the superior transport properties of XP13512 on the resulting oral bioavailability, dose proportionality, colonic absorption, and tissue distribution of gabapentin in preclinical species (Cundy et al., 2004). Gabapentin [(1-aminomethyl)-cyclohexaneacetic acid] was obtained from Teva Pharmaceuticals U.S.A. (North Wales, PA). Gabapentin hydrochloride salt and was synthesized from commercial gabapentin at XenoPort, Inc. 3H-Biotin (44 Ci/mmol) and 14C-lactate (162 mCi/mmol) were from Amersham Biosciences Inc. (Piscataway, NJ). [1-Aminomethyl-14C]-gabapentin (162 mCi/mmol) was from PerkinElmer Life and Analytical Sciences (Boston, MA). 3-Cyano-7-ethoxycoumarin, 3-cyano-7-hydroxycoumarin, 7-methoxy-4-trifluoromethylcoumarin, 7-hydroxy-4-trifluoromethyl-coumarin, 7-benzyloxy-4-(trifluoromethyl)-coumarin, and Supersomes (CYP1A2+OR, CYP2C9+ OR+b5, CYP2C19+OR+b5, CYP2D6+OR, CYP3A4+OR+b5, and CYP2E1+OR+b5) were obtained from BD Gentest (Woburn, MA). All other chemicals were obtained from Sigma-Aldrich Inc. (St. Louis, MO). Human and rat liver 9000g supernatant (S9) and liver microsomes were obtained from XenoTech LLC (Lenexa, KS). Human plasma was from Tennessee Blood Services, Inc. (Memphis, TN). Rat plasma was from Pelfreeze (Brown Deer, WI). Additional rat plasma was prepared fresh from blood obtained from male Sprague-Dawley rats by cardiac puncture. Blood was collected in heparinized tubes and processed for plasma at 4°C. Plasma was frozen and maintained at -80°C prior to use. Caco-2 S9 was prepared from cultured Caco-2 cells grown in flasks over 21 days. Cells were rinsed/scraped off into ice-cold 10 mM sodium phosphate/0.15 M potassium chloride, pH 7.4. Cells were lysed by sonication at 4°C using a probe sonicator and centrifuged at 9000g for 20 min at 4°C, and the aliquots of the resulting supernatant (S9) were transferred into 0.5-ml vials and stored at -80°C prior to use. Gabapentin (120.4 g, 0.704 mol) was added to dichloromethane (1.6 liters) in a 5-liter, round bottom flask, followed by triethylamine (294 ml, 2.11 mol). Chlorotrimethylsilane (178 ml, 1.40 mol) was added slowly while maintaining the reaction temperature below 15°C, and the resulting suspension was stirred for 30 min. 1-Chloroethyl chloroformate (100 g, 0.704 mol) was added slowly while maintaining the temperature below 15°C. Triethylamine (88 ml, 0.63 mol) was added, and the resulting suspension was stirred at room temperature for 30 min. The resulting silyl ester was converted to the corresponding acid by washing the reaction mixture with water (2 × 1 liters), followed by 1 N HCl (2 × 2 liters) then brine (2 × 500 ml). After drying over anhydrous sodium sulfate and removal of the solvent in vacuo, the crude product (190 g) was obtained as an orange oil and used in the following step without further purification. Triethylamine (395 ml, 2.84 mol) was added to isobutyric acid (254 g, 2.9 mol) in a 3-liter, round bottom flask, and the reaction mixture was cooled to room temperature. A solution of crude acid from the above reaction step (190 g, 0.69 mol) in dichloromethane (80 ml) was added slowly, maintaining the temperature below 30°C. The resulting pale yellow solution was stirred overnight. The reaction mixture was then diluted with 1 volume of dichloromethane and washed with water (6 × 500 ml), aqueous potassium bicarbonate (3 × 500 ml), and brine (2 × 500 ml). After drying over anhydrous sodium sulfate, removal of the solvent in vacuo afforded the crude product as a dark-red oil (87 g). The crude product was purified in two batches (2 × 35 g) by column chromatography on an 800-g normal phase silica gel flash column (Biotage, Charlottesville, VA) eluting with 40% diethyl ether in hexane (6 liters). Evaporation of the solvent in vacuo gave XP13512 as a colorless oil (27 g). The prodrug was dissolved in ethyl acetate/heptane (1:10) at 60°C and crystallized by slow cooling to 4°C. The white crystalline product (21 g) was isolated by filtration. 1H NMR (CDCl3, 400 MHz): δ 1.15 (d, 6H), 1.40 to 1.55 (m, 10H), 1.45 (d, 3H), 2.32 (s, 2H), 2.49 to 2.56 (m, 1H), 3.23 (d, 2H), 5.41 (t, 1H), 6.75 (q, 1H). MS(ESI) m/z 330.29 (M+H+). Elemental analysis calculated for C16H27NO6: C, 58.34; H, 8.26; N, 4.25; O, 29.14. Found: C, 58.57; H, 8.23; N, 4.26; O, 29.22. XP13512 is a crystalline solid with a melting point of 65°C. The pKa of the free acid was 5.0. Calculated logP (clogP) and clogD values for XP13512 were 3.07 and 0.43 (pH 7.4), respectively. XP13512 contains one chiral center (the acetal carbon) and is synthesized as a racemate. XP13512 was further separated into its two enantiomers by preparative chiral high-pressure liquid chromatography using a ChiralPak AD-RH column (21 × 250 mm, 5-μm particle size, Chiral Technologies, Inc., Exton, PA). XP13512 (27 g, 82 mmol) was dissolved in acetone (40 ml) and water (25 ml) in a 250-ml beaker. Aqueous sodium carbonate (1.0 M) was added slowly in 2-ml aliquots with stirring. After addition of 0.49 Eq base (40.1 ml of sodium carbonate solution), the pH was 7.3. Acetone was removed in vacuo at 25°C, and the final pH was ∼6.5. The remaining aqueous solution was lyophilized for 2 days to yield the sodium salt, which was stored in a desiccator. Chemical Stability. Buffers were prepared at pH 2.0 (using 0.1 M potassium phosphate and 0.5 M sodium chloride), pH 7.4, and pH 8.0 (using 0.1 M Tris-HCl and 0.5 M sodium chloride). Compounds (5 μM) were incubated with buffers at 37°C for 1 h in a temperature-controlled high-pressure liquid chromatography autosampler. Samples were injected at 0 and 1 h postaddition and analyzed by LC/MS/MS as described below. Metabolic Stability. XP13512 (5 μM) was incubated with the following matrices at 37°C for 1 h: 90% rat or human plasma, rat and human liver S9 at 0.5 mg protein/ml in the presence of 1 mM NADPH at pH 7.4, Caco-2 S9 (0.5 mg protein/ml) at pH 7.4, and porcine pancreatin (10 mg/ml in pH 7.5 buffer). XP13512 sodium salt (10 μM) was incubated with plasma, intestinal S9, lung S9, liver S9, and kidney S9 from rats, dogs, monkeys, and humans at 37°C for 1 h. All preparations contained 1 mg protein/ml. Samples were obtained at intervals over 1 h postaddition and were immediately quenched with methanol to prevent further conversion. Quenched samples were frozen and maintained at -80°C prior to analysis. Samples were analyzed by LC/MS/MS as described below. The rate of conversion of XP13512 to gabapentin in each matrix was calculated in picomoles per minute per milligram of protein. Inhibition of Specific P450 Isoforms by XP13512. The ability of XP13512 to inhibit cytochrome P450-mediated metabolism was examined by standard methods using specific P450 isoforms expressed in baculosomes (Supersomes; BD Gentest). Standard substrates were employed that generate fluorescent metabolites: 50 μM 7-benzyloxy-trifluoromethycoumarin (CYP3A4), 5 μM 3-cyano-7-ethoxycoumarin (CYP1A2), 75 μM 7-methoxy-trifluoromethylcoumarin (CYP2C9), 25 μM 3-cyano-7-ethoxycoumarin (CYP2C19); 1.5 μM 3-[2-(N,N-diethyl-N-methylamino)ethyl]-7-methyoxy-4-methylcoumarin) (CYP2D6), and 70 μM 7-methoxy-4-trifluoromethyl coumarin (CYP2E1). Experiments were conducted in a 96-well format, and all incubations included an NADPH cofactor mix. The final concentration of P450 protein in each incubation was 2.5 to 5.0 pM. XP13512 and positive control compounds were serially diluted in the solution of NADPH generation system to give final concentrations of up to 400 μM. The resulting solutions were incubated with a specific P450 isoform and the related substrate at 37°C for 15 to 45 min, and incubations were quenched by addition of 80% acetonitrile/20% 0.5 M Tris base. The samples were analyzed using a FlexStation fluorescence plate reader (Molecular Devices, Sunnyvale, CA). Metabolism by P450 Isoforms. Studies were also performed to determine the role of specific P450 isoforms in the metabolism of XP13512 using human liver S9 and standard inhibitors (25 μM) of each isoform: furafyline (CYP1A2), sulfaphenazole (CYP2C9), tranylcypromine (CYP2C19), quinidine (CYP2D6), and diethylditiocarbamic acid (CYP2E1). Due to an assay interference from ketoconazole, the specific role of the CYP3A4 isoform was examined using Supersomes and comparing with a control incubation in the absence of CYP3A4. All experiments used 1 mM NADPH as the cofactor and were conducted in a 96-well format. Human liver S9 fraction or Supersomes were preincubated with each inhibitor, and XP13512 (5 μM) was added to initiate the experiment. The disappearance of XP13512 was examined over the course of 10 min at 37°C. Samples were obtained at 0 and 10 min postaddition and were immediately quenched with methanol to prevent further conversion. Quenched samples were frozen and maintained at -80°C prior to analysis. Samples were analyzed by LC/MS/MS as described below. Protein Binding in Human Serum Albumin. Protein binding of XP13512 was determined by centrifugal ultrafiltration. XP13512 (5–100 μM) was incubated in human serum albumin (10 mg/ml in 25 mM Tris buffer, pH 7.4) at 37°C for 60 min. A control incubation of XP13512 was performed in the same buffer without human serum albumin. The samples were transferred to Ultrafree-MC 30,000 molecular weight cutoff filters (Millipore Corporation, Billerica, MA) and centrifuged at 4300 rpm for 30 min. The unbound XP13512 concentration in the filtrates was determined by LC/MS/MS. Cell Culture. Expression plasmids for specific solute transporters (SMVT and MCT-1) were cloned by polymerase chain reaction (PCR) using standard techniques from commercially available cRNA (BD Biosciences Clontech, Palo Alto, CA). Human embryonic kidney (HEK) cells, Chinese hamster ovary (CHO) cells, Caco-2 cells, KB cells, and Madin-Darby canine kidney (MDCK) cells were obtained from the American Type Culture Collection (Manassas, VA) and cultured as indicated by the supplier. An HEK-derived cell line (PEAKrapid cells) was obtained from Edge BioSystems (Gaithersburg, MD) and was shown to endogenously express high levels of MCT-1 based on quantitative PCR (K. Woodford and N. Zerangue, unpublished data). HEK cells conditionally expressing SMVT were isolated by transfecting the SMVT expression plasmid into HEK-TREx host cells (Invitrogen, Carlsbad, CA), selecting for G418-resistant clones and identifying clones with robust inducible expression as per manufacturer's instructions. CHO cells stably expressing SMVT were isolated after transfection of the SMVT expression plasmid and clones were identified by screening for robust radiolabeled substrate uptake. Xenopus laevis frogs were obtained from Xenopus I (Ann Arbor, MI) and housed as recommended. Oocytes were harvested from frogs using standard protocols (Wang et al., 1999). The follicles were removed, and the oocytes were injected with cRNA encoding human SMVT or MCT-1. Transepithelial Transport. Caco-2 and MDCK cells were seeded into 24-well transwell plates with 3-μm filters (Corning/Costar, Acton, MA) at a density of 500,000 cells/well and allowed to differentiate in the transwell plates; 21 days for Caco-2 or 5 days for MDCK cells. Test compounds were dissolved into either pH 6.5 (apical MES buffer) or pH 7.4 (basolateral HBSS buffer) at concentrations of 100 to 200 μM and added to the appropriate chambers. Samples were removed from the receiving chambers at various time points, and transport was measured by determining the concentration of XP13512 and gabapentin (produced by esterase cleavage within the epithelial cells) by LC/MS/MS (as described below). Apparent permeability coefficients (Papp) were calculated by standard methods (Stewart et al., 1995). Integrity of the monolayer was confirmed by determining the permeability of 3H-inulin. If greater than 0.5% of the inulin was detected in the receiving chamber, the transwells were discarded. The control compound propranolol was simultaneously evaluated to demonstrate batch-to-batch consistency of Caco-2 cell monolayers. The Papp value for this compound was approximately 2.0 × 10-5 cm/s. Artificial Membrane Permeation Assays. Artificial membranes were prepared by adding 4 μl of 2% (w/v) dioleoylphosphatidylcholine in dodecane onto the hydrophobic filters (0.45 μM polyvinylidene fluoride) on the base of the wells of a 96-well donor plate (Millipore Corporation). Gabapentin or XP13512 (150 μl of 50 μM solution in 0.1M Tris buffer, pH 6.5 or 7.4) were added to the donor wells in triplicate. The plate was placed onto a 96-well acceptor plate (Agilent Technologies, Palo Alto, CA), in which each well contained 400 μl of 0.1 M Tris, pH 7.4. Following incubation for 2 h at room temperature, samples of the donor and receiver chambers were removed for analysis by LC/MS/MS. The permeability coefficient through the artificial membrane (Pam) was calculated using standard methods (Sugano et al., 2001). Competition Assays. HEK cells expressing MCT-1, CHO cells expressing SMVT, or KB cells endogenously expressing l-type amino acid transporter (LAT1) were plated (100,000 cells/well) into white 96-well clear bottom plates (Greiner Bio-One GmbH, Frickenhausen, Germany) precoated with poly-d-lysine. Cells were grown at 37°C under standard cell culture conditions for 1 to 2 days before use. Radiolabeled substrate (14C-lactate for MCT-1, 3H-biotin for SMVT, and 14C-gabapentin for LAT1) were added to each well (∼50,000 cpm/well) in the presence or absence of various concentrations of gabapentin or XP13512 in duplicate. Plates were incubated at room temperature for 2 to 60 min. Excess radiolabeled substrate was removed, and cells were washed three times with a 96-well plate washer with cold assay buffer. Scintillation fluid was added to each well, and the plates were sealed and counted in a 96-well plate-based scintillation counter. Data were subjected to nonlinear regression analysis using Prism Software (GraphPad Software Inc., San Diego, CA). Uptake into Mammalian Cells. Uptake of XP13512 by MCT-1 was examined in HEK-derived cells endogenously expressing the transporter. Cells were seeded in 96-well poly-d-lysine-coated plates (100,000 cells/well) and grown for 1 to 2 days. Cells were washed and incubated with 1 mM XP13512 (with or without 10 mM lactate) for 5 min in HBSS assay buffer (pH 6.8) in quadruplicate. Excess substrate was removed by washing with cold assay buffer. Cells were lysed using 50% ethanol/water, and the cell debris was pelleted by centrifugation. The supernatant was analyzed by LC/MS/MS. HEK cells conditionally expressing SMVT were seeded in 96-well plates (100,000 cells/well). One day after seeding, tetracycline (1 μg/ml) was added to one-half of the wells to induce the expression of SMVT on the surface of the cells. After overnight treatment, the cells were incubated with XP13512 (12.5–100 μM) for 60 min in HBSS buffer (pH 7.4) in quadruplicate. Phenylalanine (10 mM) was included in all incubations to inhibit the uptake of gabapentin through the endogenous LAT1 expressed in HEK cells. Excess compound was removed by washing with cold assay buffer, and cells were lysed and prepared as above for LC/MS/MS analysis. Electrophysiology Assay in SMVT-Expressing Oocytes. SMVT is an electrogenic sodium-dependent transporter. The SMVT-mediated transport of XP13512 was evaluated by standard two-electrode voltage clamp electrophysiology experiments using X. laevis oocytes expressing hSMVT. Oocytes were selected 2 to 4 days after injection of SMVT-cRNA. Expression of SMVT on the surface of the oocytes was confirmed by uptake of 3H-biotin. Gabapentin and XP13512 (0.2 to 54 μM) were each applied to oocytes in the bath solution for ∼2 to 5 s, and the induced currents were monitored. Control experiments were conducted using uninjected oocytes. Maximal currents observed after compound addition were expressed as a percentage of the maximal current seen with 0.5 mM biotin to normalize for batch-to-batch variations. Dose-response curves were analyzed by nonlinear regression using Prism software. Direct Uptake by MCT-1-Expressing Oocytes. MCT-1-mediated transport of XP13512 was evaluated by direct measurement of uptake into transfected oocytes. Oocytes were selected 2 to 4 days after injection with MCT-1-cRNA. MCT-1-expressing and uninjected oocytes (negative control) were incubated with XP13512 (0.25–1.0 mM) (four oocytes per sample; two or three samples per concentration) at room temperature for 5 min. Oocytes were removed, washed with fresh assay buffer three times, and extracted as described above. Concentrations of prodrug and gabapentin in cell lysates were determined by LC/MS/MS. Uptake of prodrug was compared for oocytes expressing MCT-1 and uninjected oocytes to determine the passive and MCT-mediated components of transport. Analytical Methods. Samples were analyzed immediately or frozen and stored at -80°C prior to analysis by a sensitive and specific LC/MS/MS method for simultaneous determination of prodrug, gabapentin, and gabapentin lactam. The system comprised two model LC10Advp pumps and a model SCL10Avp controller (Shimadzu Scientific Instruments, Inc., Columbia, MD) with a Model HTS-PAL autosampler with cooling stack (Leap Technologies, Carrboro, NC). The column was a Zorbax XDB C8 (5 μm; 150 × 4.6 mm) (Agilent Technologies). The mobile phase was A, 0.1% formic acid in water; and B, 0.1% formic acid in acetonitrile, with a flow rate of 800 μl/min (200 μl/min to the detector) and a linear gradient from 5% B to 98% B over 3.5 min. The detector was an API 2000 LC/MS/MS (Applied Biosystems, Foster City, CA), and the multiple reaction monitoring transitions (atomic mass units) were 330.10 and 197.97 for XP13512, 172.10 and 137.20 for gabapentin, and 154.00 and 95.00 for gabapentin lactam. The injection volume was 20 μl. The method was linear for XP13512 over the concentration range 0.004 to 2.5 μg/ml and for gabapentin or gabapentin lactam over the range 0.004 to 10 μg/ml. The limit of quantitation for all three analytes was 0.004 μg/ml. Intraday precision (percent CV) was <17% for all three analytes; intraday accuracy (percent deviation) was <12%. Chemical and Metabolic Stability.Table 1 shows the extent of conversion of XP13512 to gabapentin after incubation of XP13512 with various buffers or tissue preparations. XP13512 was chemically stable for 1 h at 37°C over the pH range 2 to 8. Hydrolysis of XP13512 to gabapentin was slow in human plasma, moderate in pancreatin and Caco-2 cell homogenate, and rapid in rat plasma or human and rat liver homogenates. Release of gabapentin was quantitative and no gabapentin lactam was detected in any of the incubations (limit of detection 1%). Similar rates of hydrolysis of XP13512 sodium salt to gabapentin were seen in tissues from rats, monkeys, and humans, whereas conversion of XP13512 sodium salt to gabapentin in intestinal tissues from dogs was slower (Table 2). 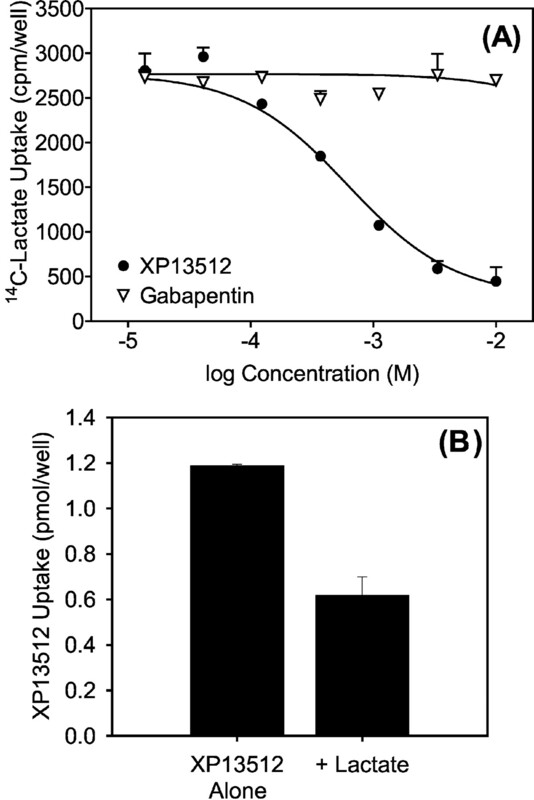 Notably, the formation of gabapentin lactam, a potential metabolite of XP13512, was not observed in vitro in any of the tissues examined. Stability of XP13512 in buffer and tissues in vitro All incubations were for 1 h at 37°C. The initial XP13512 concentration was 5 μM. Gabapentin lactam was not detected in any of the incubations (<1% release). Stability of XP13512 sodium salt in tissues from different species All incubations were for 1 h at 37°C. The initial XP13512 concentration was 10 μM. All preparations contained 1 mg protein/ml. P450 Metabolism Studies. XP13512 produced no significant inhibition of the major isoforms of P450 (CYP1A2, CYP2C9, CYP2C19, CYP2D6, CYP2E1, and CYP3A4) at concentrations up to 400 μM. In addition, XP13512 was not a substrate for any of these isoforms of P450 in human liver S9 (CYP1A2, CYP2C9, CYP2C19, CYP2D6, and CYP2E1) or transfected baculosomes (CYP3A4). Protein Binding of XP13512 in Human Serum Albumin. XP13512 was 78 to 87% bound to human serum albumin over the concentration range 5 to 100 μM. Protein binding of gabapentin itself in plasma of rat, monkey, and human has been previously reported as <3% (Radulovic et al., 1995). Metabolic Stability of XP13512 Isomers.Table 3 shows the extent of conversion of the individual XP13512 isomers to gabapentin after incubation with tissue preparations. Minor differences were observed in rat tissues, but the extent of conversion of the two isomers to gabapentin was essentially identical in human plasma, human liver S9, and Caco-2 cell S9. Metabolic stability of the separated isomers of XP13512 in tissues All incubations were for 1 h at 37°C. The initial prodrug concentration was 5 μM. Transepithelial Transport across Polarized Cells.Table 4 compares the epithelial cell permeabilities of gabapentin and XP13512 determined in Caco-2 and MDCK cell monolayers. Papp for gabapentin was low in both cell types and in both directions, consistent with poor passive absorption. XP13512 was partially hydrolyzed during transit through these cells. The Papp values for XP13512, determined from the sum of the prodrug and released gabapentin appearing in the receiving chamber, were greater than 5 × 10-6 cm/s in both cell types, suggesting the prodrug will be efficiently absorbed in vivo (Stewart et al., 1995). In addition, transport of the prodrug in the apical to basolateral direction was approximately 3- to 5-fold greater than from basolateral to apical. Permeability coefficients (Papp) for transepithelial transport of XP13512 or gabapentin across Caco-2 and MDCK monolayers Compounds were applied to the donor compartment at 100 to 200 μM and incubated for 1 h at 37°C. MCT-1-Mediated Transport. Both XP13512 and gabapentin were tested for their ability to compete with uptake of 14C-lactate, a natural substrate for MCT-1, in HEK-derived cells endogenously expressing high levels of MCT-1 (Fig. 2A). The prodrug inhibited the uptake of lactate with an IC50 of 620 μM, whereas gabapentin did not significantly interact with MCT-1. Uptake of XP13512 measured in these cells by LC/MS/MS was decreased 50% by excess lactate demonstrating that transport of prodrug into cells was in part mediated by MCT-1 (Fig. 2B). The direct uptake of XP13512 into MCT-1-expressing oocytes was greater than into uninjected oocytes (Fig. 3A), as measured by LC/MS/MS. A significant portion of this total uptake was therefore dependent on the expression of MCT-1. Analysis of the MCT-1-specific component (Fig. 3B) revealed a saturable uptake with a Km of approximately 220 μM and a Vmax of ∼6 pmol/oocyte. 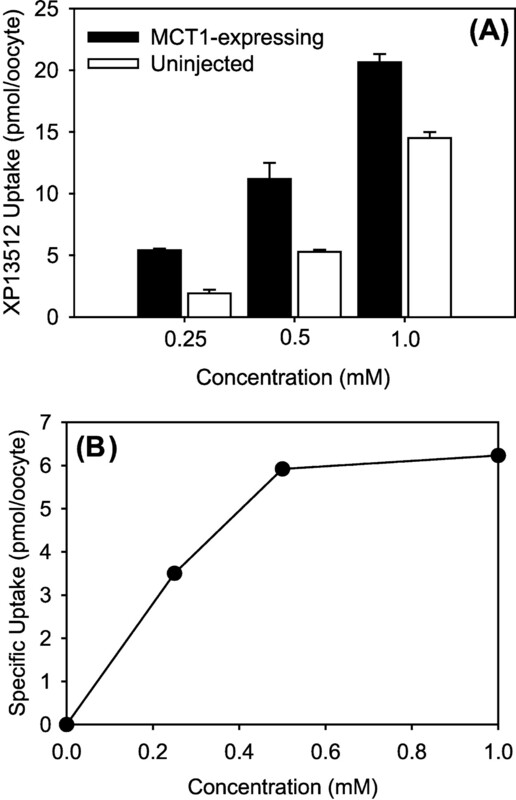 Uptake of XP13512 into uninjected oocytes may have been the result of passive diffusion or transport by an endogenous monocarboxylate transporter reported to be expressed in Xenopus oocytes (Tosco et al., 2000). Interaction of XP13512 with HEK cells endogenously expressing MCT-1. Increasing concentrations of XP13512 inhibited 14C-lactate uptake into HEK cells after incubation for 60 min, whereas gabapentin had no effect (A). Excess lactate (10 mM) partially blocked the direct uptake of XP13512 (1 mM) into HEK cells (B). Total intracellular concentrations of XP13512 and gabapentin were determined by LC/MS/MS. Data are the mean ± S.E. for four determinations. Effect of concentration of XP13512 sodium salt on uptake of prodrug into oocytes expressing MCT-1. Intracellular concentrations of prodrug and gabapentin were determined by LC/MS/MS analysis. XP13512 uptake into MCT-1-expressing oocytes was greater than for uninjected oocytes (A). Data represent mean ± S.E. for four oocytes per condition. Subtraction of data for uninjected cells from values obtained in injected cells showed specific uptake of XP13512 into MCT-1-expressing oocytes (B). SMVT-Mediated Transport. XP13512 inhibited biotin uptake into SMVT-expressing CHO cells with an IC50 of 12 μM, whereas gabapentin itself did not interact with SMVT (Fig. 4). XP13512 showed a dose-dependent increase in induced currents in voltage-clamped SMVT-expressing oocytes (Fig. 5A). No currents were induced in uninjected oocytes (Fig. 5B). Currents induced by XP13512 were abolished when SMVT-expressing oocytes were pretreated with 0.5 mM biotin, confirming that these currents were specific to SMVT. The relative maximum currents induced by XP13512 (Fig. 5C) indicate that XP13512 is a substrate for SMVT with a Km of ∼3 μM and a Vmax of ∼40% of that produced by biotin. Direct uptake of XP13512 was confirmed in HEK cells conditionally expressing SMVT upon treatment with tetracycline (data not shown). SMVT expression was required for biotin uptake, and no specific uptake of gabapentin was seen. XP13512 was not detected in these cells; however, gabapentin derived from intracellular hydrolysis of XP13512 was detected. The level of uptake was high, and a portion of that uptake appeared to be mediated by SMVT. The remaining uptake was likely due to a combination of passive diffusion and transport by MCT-1, which is endogenously expressed at high levels in HEK cells. 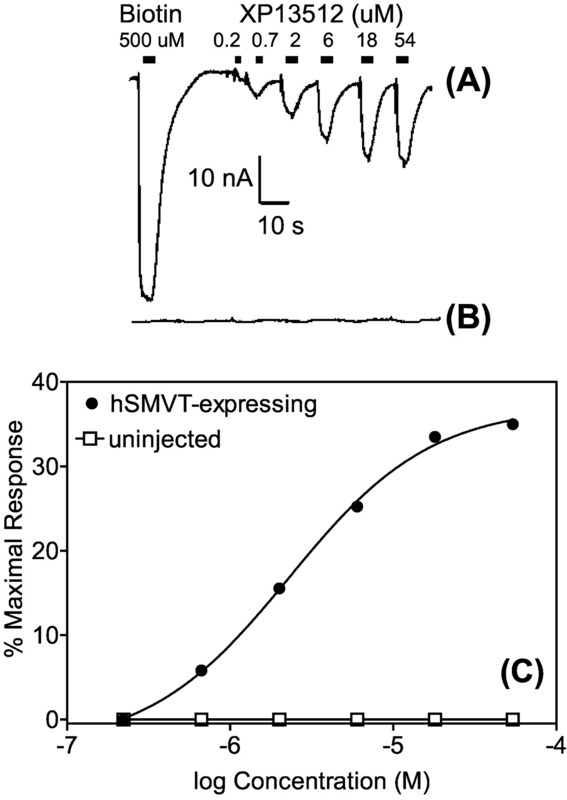 Analysis of the effect of prodrug concentration on the SMVT-mediated portion revealed saturable uptake with a Km of ∼20 μM, comparable with the affinity of this compound for SMVT determined from the competition and electrophysiological assays. Effect of increasing concentrations of XP13512 or gabapentin on uptake of 3H-biotin into SMVT-expressing CHO cells. XP13512 inhibited uptake of 3H-biotin whereas gabapentin had no effect. Data are the mean ± S.E. for two determinations. Effect of XP13512 on electrophysiological responses of SMVT-expressing oocytes. Biotin (positive control) and XP13512 induced significant currents in voltage-clamped SMVT-expressing oocytes (A) but not in uninjected oocytes (B), indicating SMVT-mediated transport. The maximal current induced by XP13512 (Vmax) was approximately 40% of that produced by biotin (C). LAT1-Mediated Transport. 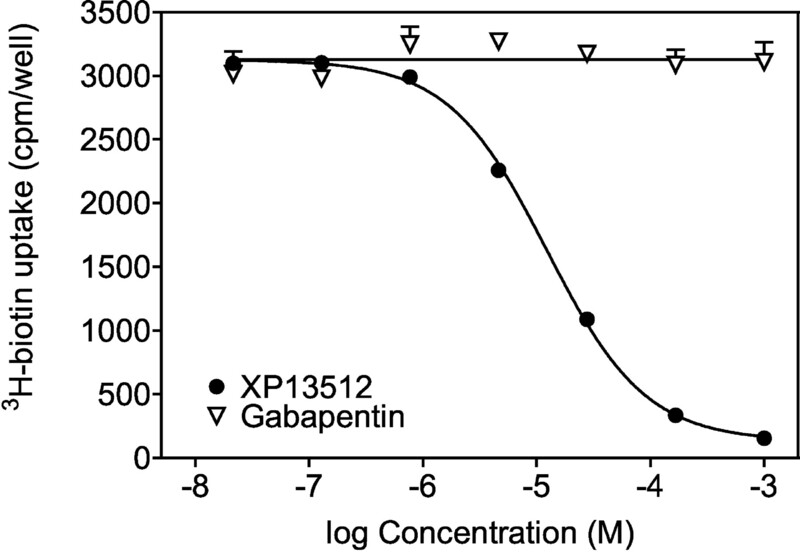 XP13512 did not significantly inhibit the uptake of radiolabeled gabapentin by LAT1 in KB cells (IC50 > 1 mM). In addition, XP13512 did not stimulate the release of radiolabeled gabapentin from preloaded LAT1-expressing cells. These results indicate that XP13512 is not a substrate for LAT1. Transport across Artificial Lipid Membranes. A parallel artificial membrane assay was used to study the passive permeability of XP13512, independent of active transport mechanisms. The Pam values determined for XP13512 and gabapentin are shown in Table 5. Data are compared with control compounds with high, medium, and low passive permeability properties (diltiazem, metoprolol, and acyclovir, respectively). Permeability was tested at both pH 6.5 and 7.4. The permeability coefficient for the prodrug was greater at the lower pH, consistent with this compound having higher passive permeability properties in its uncharged state. Effect of donor compartment pH on permeability coefficients (Pam) of various compounds in the parallel artificial membrane permeability assay All compounds were incubated at 50 μM for 2 h at room temperature. At physiological pH, gabapentin is a zwitterion with limited ability to permeate cellular membranes by passive diffusion. Several studies have suggested that gabapentin is a substrate for saturable solute transporters expressed in the intestine and blood brain barrier (Stewart et al., 1993; Uchino et al., 2002). Transport of gabapentin into the brain probably involves the l-type amino acid transporter LAT1, which is abundantly expressed in both the luminal and abluminal membranes of rat brain capillary endothelial cells (Duelli et al., 2000; Matsuo et al., 2000). In contrast, LAT1 is not significantly expressed in human intestine (Prasad et al., 1999b). Gabapentin is not a substrate for the intestinal amino acid transporters B0,+, ATB0+, or LAT2 in transfected oocytes, whereas it is a substrate for the organic anion transporter OCTN2 (N. Zerangue, unpublished data). However, the lack of significant absorption of gabapentin from the colon (Kriel et al., 1997) appears inconsistent with the widespread intestinal expression of OCTN2 in both the small and large intestine (Sekine et al., 1998; Tamai et al., 1998; Slitt et al., 2002). Although OCTN2 may mediate apical uptake of gabapentin in the intestine, an understanding of the basolateral transport of gabapentin is necessary to explain localized absorption of the drug in the upper gastrointestinal tract. XP13512 is a prodrug of gabapentin designed to be absorbed throughout the gastrointestinal tract by high-capacity nutrient transporters. Reversible modification of either the amine or carboxylate functionalities of gabapentin yields compounds that are monoanionic or monocationic at physiological pH. Such compounds are potential substrates for organic anion or cation transporters expressed apically along the length of the intestine, including the colon. Derivatization of the carboxylic acid group of gabapentin as a simple ester prodrug proved impractical, however, since such compounds readily cyclize to yield gabapentin lactam. Similarly, double prodrugs of gabapentin, involving reversible masking of both the amine and the carboxylate moieties, also displayed increased susceptibility to form gabapentin lactam (data not shown). The lactam, a contaminant present in the marketed gabapentin formulation, has been reported to display both proconvulsant and neuroprotective effects (Potschka et al., 2000; Lagrèze et al., 2001). By contrast, reversible masking of the amine group of gabapentin with an acyloxyalkylcarbamate promoiety (as in XP13512) provided anionic compounds that were potential substrate for carboxylate transporters. Acyloxyalkylcarbamate prodrugs of simple amines were first described in the 1980s (Alexander et al., 1988). XP13512 represents a novel application of this approach. Notably, XP13512 does not undergo cyclization to the lactam in vitro or in vivo. MCT-1 is a member of a family of at least nine gene products that function as proton-coupled transporters of simple organic carboxylates, such as lactate, pyruvate, and short-chain fatty acids, as well as certain monocarboxylate drugs (e.g., pravastatin, valproate, carindacillin; for review, see Halestrap and Price, 1999; Enerson and Drewes, 2003). MCT-1 is highly expressed within small and large intestinal tissue and contributes to the high-capacity (grams/day) uptake into colonocytes of butyrate produced by microbial fermentation of carbohydrates. SMVT is a sodium-dependent monocarboxylate transporter whose natural substrates are biotin, lipoate, and pantothenate (Wang et al., 1999). Colonic absorption of biotin has been demonstrated in humans and pigs (Sorrell et al., 1971; Barth et al., 1986). This uptake appears to be SMVT-mediated, based on demonstration of an Na+-dependent, specialized carrier-mediated system for biotin uptake in a human-derived, nontransformed colonic epithelial cell line (Said et al., 1998). Furthermore, our own studies have shown a significant level of mRNA encoding SMVT in fresh human colonic tissue biopsy samples, based on quantitative PCR (K. Woodford and N. Zerangue, unpublished data). In the present work, gabapentin showed no significant interaction with either MCT-1 or SMVT, presumably due to its charged amine functionality. XP13512 combines properties required for recognition by MCT-1 and SMVT with the need for nontoxic breakdown products. In addition to release of gabapentin, hydrolysis of XP13512 yields equimolar amounts of isobutyric acid, acetaldehyde, and carbon dioxide. Isobutyric acid and acetaldehyde are both listed as generally recognized as safe materials in the Food and Drug Administration food additive database (Center for Food Safety and Applied Nutrition, U.S. Food and Drug Administration, U.S. Department of Health and Human Services). Isobutyric acid is also a metabolite of the widely used food additive sucrose acetate isobutyrate (Reynolds, 1998). Acetaldehyde is a metabolite of ethanol and several approved prodrugs including candesartan cilexetil (Gleiter and Morike, 2002) and cefuroxime axetil (Campbell and Langley, 1985). Quantities of acetaldehyde released by XP13512 at clinical doses are expected to be low in comparison with exposure from dietary sources. XP13512 had micromolar affinity for both MCT-1 and SMVT in competition studies using transporter-expressing cultured cells, based on inhibition of uptake of natural substrates. Since affinity alone is not a definitive proof of transport, direct uptake of XP13512 by both transporters was also demonstrated. Transport of XP13512 by MCT-1 was confirmed in HEK cells with high endogenous MCT-1 expression using LC/MS/MS, and this uptake was partially inhibited by excess lactate. XP13512 was also taken up by X. laevis oocytes expressing human MCT-1 to a significantly greater extent than uninjected oocytes. XP13512 induced significant currents in electrophysiology studies using SMVT-expressing oocytes; in this assay, XP13512 had a Km of ∼3 μM and a Vmax approximately 40% of that produced by biotin. Uptake of XP13512 by HEK cells conditionally overexpressing SMVT was shown to be tetracycline dependent and was partially inhibited by excess biotin. XP13512 was not a substrate or inhibitor of LAT1. This observation is not surprising given the zwitterionic nature of the natural substrates of this transporter. Transcellular flux of XP13512 across Caco-2 cell monolayers was 5-fold greater in the apical to basolateral direction, suggesting that the prodrug interacts with one or more apically expressed intestinal transporters. Both MCT-1 and SMVT are expressed at high levels in Caco-2 cells (Prasad et al., 1999a; Stein et al., 2000). The high apparent permeability of XP13512 observed in this assay (3.1–6.0 × 10-5 cm/s) suggests that the compound should be well absorbed in vivo after oral administration. Similar evidence of active transport was observed using MDCK cell monolayers. The flux of XP13512 in the parallel artificial membrane permeability assay suggests that the prodrug should have some ability to passively diffuse across cells depending on local pH. The pKa of XP13512 is 5.0; therefore, passive diffusion of the nonionized form is likely to be a minor component of the extensive absorption seen after colonic dosing (Cundy et al., 2004). The relative contributions of active transport and passive absorption to the total absorption of XP13512 in humans will be dependent on multiple factors, including the specific region of the intestine involved, the relative expression of SMVT and MCT-1 within that region, the transit time, surface area, and the local pH. In the absence of specific animal or human models with deletion mutations for SMVT and/or MCT-1, it is not possible to determine the relative contributions of these active processes in vivo. However, the fact that XP13512 is a substrate for multiple transport systems in its free acid form in vitro suggests that these transporters are likely to play a significant role in the absorption of XP13512 from the large intestine. MCT-1 and SMVT are high-capacity transporters; therefore, endogenous ligands are unlikely to affect the absorption of XP13512. Similarly, at the doses contemplated for clinical use, the prodrug is unlikely to affect absorption of endogenous ligands. The potential for uptake of XP13512 by additional transporters such as the bicarbonate/small-chain fatty acid anion exchangers present in the human colon has not been studied. XP13512 was chemically stable at physiological pH but was rapidly hydrolyzed to gabapentin in homogenates of Caco-2 cells and rat or human liver, presumably by nonspecific carboxylesterases. No other metabolites were observed. Gabapentin lactam was considered a potential metabolite of XP13512. However, the lactam was not detected in any of the in vitro incubations. These results suggest that the prodrug would have sufficient luminal stability to be absorbed and would subsequently undergo extensive first pass conversion to gabapentin. There were no major differences in the rates of conversion of XP13512 to gabapentin in tissues from rats, dogs, monkeys, and humans. Previous studies with gabapentin have reported that dog is the only species to significantly metabolize gabapentin (Radulovic et al., 1995). On the basis of our own data and the published data for gabapentin, rats and monkeys were selected as the species for further preclinical assessment. The separated isomers of XP13512 showed similar stability in human tissues. Therefore, no differences in the in vivo pharmacokinetics of the two isomers are anticipated. XP13512 was shown to have no significant interaction with the major P450 isoforms, either as a substrate or as an inhibitor. Therefore, the likelihood of significant drug-drug interactions following administration of XP13512 in the clinic is considered to be low. Drug interactions as a result of competition for active transport pathways are also considered to be unlikely, based on the high capacity of the transporters targeted for XP13512 absorption. In conclusion, XP13512 is a novel prodrug of gabapentin designed to overcome the pharmacokinetic limitations of gabapentin. 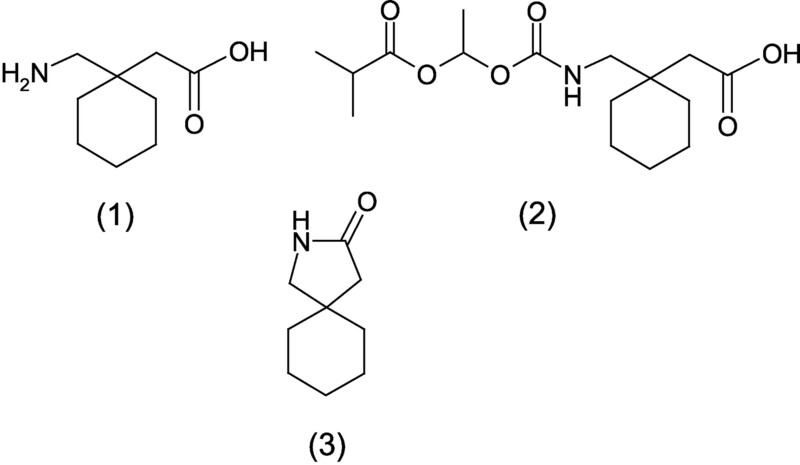 The prodrug is chemically stable and is rapidly converted to gabapentin by nonspecific esterases in tissues that would be encountered following oral absorption. In contrast to gabapentin, the prodrug is actively transported by at least two high-capacity solute transporters (MCT-1 and SMVT) that are expressed along the length of the intestine. In addition, XP13512 displays pH-dependent passive permeability. Therefore, the in vivo absorption of XP13512 is likely to be mediated by a combination of passive absorption and active transport. This would be expected to lead to efficient oral bioavailability without the limitation of saturation observed with oral gabapentin. As a result, oral dosing of XP13512 should provide greater dose proportionality and hence more predictable gabapentin exposure than currently provided by oral gabapentin. Furthermore, the broad intestinal distribution of MCT-1 and SMVT should facilitate colonic absorption of XP13512, raising the possibility that the prodrug may be successfully incorporated into a controlled release formulation. Such a formulation may deliver a sustained level of gabapentin in plasma, allowing a decreased frequency of dosing, improved patient compliance, and ultimately superior therapy. The effects of the superior transport properties of XP13512 on the resulting oral bioavailability, dose proportionality, colonic absorption, and tissue distribution of gabapentin in rats and monkeys are described in a companion paper (Cundy et al., 2004). We thank Laxminarayan Bhat, Manisha Kotecha, Yunxiao Li, Madhu Menaka, Khan Pham, Emily Tate, Katie Woodford, and Fenmei Yao (XenoPort, Inc.) for additional contributions. ABBREVIATIONS: XP13512, (±)-1-([(α-isobutanoyloxyethoxy)carbonyl]aminomethyl)-1-cyclohexane acetic acid; MCT-1, monocarboxylate transporter type-1; SMVT, sodium-dependent multivitamin transporter; LC/MS/MS, liquid chromatography-tandem mass spectrometry; P450, cytochrome P450; PCR, polymerase chain reaction; HEK, human embryonic kidney; CHO, Chinese hamster ovary; MDCK, Madin-Darby canine kidney; HBSS, Hanks' balanced salt solution; Papp, apparent permeability value; Pam, artificial membrane permeability value; LAT1, L-type amino acid transporter. Alexander J, Cargill R, Michelson SR, and Schwam H (1988) (Acyloxy)alkyl carbamates as novel bioreversible prodrugs for amines: increased permeation through biological membranes. J Med Chem 31: 318-322. Backonja M, Beydoun A, Edwards KR, Schwartz SL, Fonseca V, Hes M, LaMoreaux L, and Garofalo E (1998) Gabapentin for the symptomatic treatment of painful neuropathy in patients with diabetes mellitus: a randomized controlled trial. JAm Med Assoc 280: 1831-1836. Barth CA, Rigg M, and Hagenmeister H (1986) Biotin absorption from the hind-gut of the pig. J Anim Physiol Anim Nutr 55: 128-134. Berry DJ, Beran RG, Plunkett MJ, Clarke LA, and Hung WT (2003) The absorption of gabapentin following high dose escalation. Seizure 12: 28-36. Boyd RA, Turck D, Abel RB, Sedman AJ, and Bockbrader HN (1999) Effects of age and gender on single-dose pharmacokinetics of gabapentin. Epilepsia 40: 474-479. Campbell CJ and Langley C (1985) Measurement of rat-intestinal cefuroxime axetil esterase activity: comparison of an HPLC and coupled-enzyme assay. Xenobiotica 15: 1011-1019. Cundy KC, Annamalai T, Bu L, De Vera J, Estrela J, Luo W, Shirsat P, Torneros A, Yao F, Zou J, et al. (2004) XP13512 [(±)-1-([(α-isobutanoyloxyethoxy)carbonyl]aminomethyl)-1-cyclohexane acetic acid], a novel gabapentin prodrug: II. improved oral bioavailability, dose proportionality, and colonic absorption compared with gabapentin in rats and monkeys. J Pharmacol Exp Ther 311: 324-333. Duelli R, Enerson BE, Gerhart DZ, and Drewes LR (2000) Expression of large amino acid transporter LAT1 in rat brain endothelium. J Cereb Blood Flow Metab 20: 1557-1562. Enerson BE and Drewes LR (2003) Molecular features, regulation and function of monocarboxylate transporters: implications for drug delivery. J Pharm Sci 92: 1531-1544. Garcia-Borreguero D, Larrosa O, de la Llave Y, Verger K, Masramon X, and Hernandez G (2002) Treatment of restless legs syndrome with gabapentin: a double-blind, cross-over study. Neurology 59: 1573-1579. Gidal BE, DeCerce J, Bockbrader HN, Gonzalez J, Kruger S, Pitterle ME, Rutecki P, and Ramsay RE (1998) Gabapentin bioavailability: effect of dose and frequency of administration in adult patients with epilepsy. Epilepsy Res 31: 91-99. Gidal BE, Radulovic LL, Kruger S, Rutecki P, Pitterle M, and Bockbrader HN (2000) Inter- and intra-subject variability in gabapentin absorption and absolute bioavailability. Epilepsy Res 40: 123-127. Gleiter CH and Morike KE (2002) Clinical pharmacokinetics of candesartan. Clin Pharmacokinet 41: 7-17. Guttuso T Jr, Kurlan R, McDermott MP, and Kieburtz K (2003) Gabapentin's effects on hot flashes in postmenopausal women: a randomized controlled trial. Obstet Gynecol 101: 337-345. Halestrap AP and Price NT (1999) The proton-linked monocarboxylate transporter (MCT) familiy: structure, function and regulation. Biochem J 343: 281-299. Kriel RL, Birnbaum AK, Cloyd JC, Ricker BJ, Jones Saete C, and Caruso KJ (1997) Failure of absorption of gabapentin after rectal administration. Epilepsia 38: 1242-1244. Lagrèze WA, Muller-Velten R, and Feuerstein TJ (2001) The neuroprotective properties of gabapentin-lactam. Graefes Arch Clin Exp Ophthalmol 239: 845-849. Matsuo H, Tsukada S, Nakata T, Chairoungdua A, Kim DK, Cha SH, Inatomi J, Yorifuji H, Fukuda J, Endou H, et al. (2000) Expression of a system l neutral amino acid transporter at the blood-brain barrier. Neuroreport 11: 3507-3511. McLean MJ (1999) Gabapentin in the management of convulsive disorders. Epilepsia 40 (Suppl 6): S39-S50. McLean MJ (1995) Gabapentin. Epilepsia 36 (Suppl 2): S73-S86. Pollack MH, Matthews J, and Scott EL (1998) Gabapentin as a potential treatment for anxiety disorders. Am J Psychiatry 155: 992-993. Potschka H, Feuerstein TJ, and Loscher W (2000) Gabapentin-lactam, a close analogue of the anticonvulsant gabapentin, exerts convulsant activity in amygdala kindled rats. Naunyn Schmiedebergs Arch Pharmacol 361: 200-205. Prasad PD, Wang H, Huang W, Fei YJ, Leibach FH, Devoe LD, and Ganapathy V (1999a) Molecular and functional characterization of the intestinal Na+-dependent multivitamin transporter. Arch Biochem Biophys 366: 95-106. Prasad PD, Wang H, Huang W, Kekuda R, Rajan DP, Leibach FH, and Ganapathy V (1999b) Human LAT1, a subunit of system l amino acid transporter: molecular cloning and transport function. Biochem Biophys Res Commun 16: 283-288. Radulovic L, Turck D, Von Hodenberg A, Vollmer K, McNally W, Dehart P, Hanson B, Bockbrader H, and Chang T (1995) Disposition of gabapentin (Neurontin) in mice, rats, dogs and monkeys. Drug Metab Dispos 23: 441-448. Reynolds RC (1998) Metabolism and pharmacokinetics of sucrose acetate isobutyrate (SAIB) and sucrose octa-isobutyrate (SOIB) in rats, dogs, monkeys or humans: a review. Food Chem Toxicol 36: 95-99. Rice AS and Maton S; Postherpetic Neuralgia Study Group (2001) Gabapentin in postherpetic neuralgia: a randomised, double blind, placebo controlled study. Pain 94: 215-224. Richter A, Anton SE, Koch P, and Dennett SL (2003) The impact of reducing dose frequency on health outcomes. Clin Ther 25: 2307-2335. Rowbotham M, Harden N, Stacey B, Bernstein P, and Magnus-Miller L (1998) Gabapentin for the treatment of postherpetic neuralgia: a randomized controlled trial. J Am Med Assoc 280: 1837-1842. Said HM, Ortiz A, McCloud E, Dyer D, Moyer MP, and Rubin S (1998) Biotin uptake by human colonic epithelial NCM460 cells: a carrier-mediated process shared with pantothenic acid. Am J Physiol 275: C1365-C1371. Sekine T, Kusuhara H, Utsunomiya-Tate N, Tsuda M, Sugiyama Y, Kanai Y, and Endou H (1998) Molecular cloning and characterization of high-affinity carnitine transporter from rat intestine. Biochem Biophys Res Commun 251: 586-591. Slitt AL, Cherrington NJ, Hartley DP, Leazer TM, and Klaassen CD (2002) Tissue distribution and renal developmental changes in rat organic cation transporter mRNA levels. Drug Metab Dispos 30: 212-219. Sorrell MF, Frank O, Thomson AD, Aquino A, and Baker H (1971) Absorption of vitamins from the large intestine. Nutr Res Int 3: 143-148. Stein J, Zores M, and Schroder O (2000) Short-chain fatty acid (SCFA) uptake into Caco-2 cells by a pH-dependent and carrier mediated transport mechanism. Eur J Nutr 39: 121-125. Stewart BH, Chan OH, Lu RH, Reyner EL, Schmid HL, Hamilton HW, Steinbaugh BA, and Taylor MD (1995) Comparison of intestinal permeabilities determined in multiple in vitro and in situ models: relationship to absorption in humans. Pharm Res (NY) 12: 693-699. Stewart BH, Kugler AR, Thompson PR, and Bockbrader HN (1993) A saturable transport mechanism in the intestinal absorption of gabapentin is the underlying cause of the lack of proportionality between increasing dose and drug levels in plasma. Pharm Res (NY) 10: 276-281. Sugano K, Hamada H, Machida M, Ushio H, Saitoh K, and Terada K (2001) Optimized conditions of bio-mimetic artificial membrane permeation assay. Int J Pharm 228: 181-188. Tamai I, Ohashi R, Nezu J, Yabuuchi H, Oku A, Shimane M, Sai Y, and Tsuji A (1998) Molecular and functional identification of sodium ion-dependent, high affinity human carnitine transporter OCTN2. J Biol Chem 273: 20378-20382. Tosco M, Orsenigo MN, Gastaldi G, and Faelli A (2000) An endogenous monocarboxylate transport in Xenopus laevis oocytes. Am J Physiol Regul Integr Comp Physiol 278: R1190-5. Uchino H, Kanai Y, Kim do K, Wempe MF, Chairoungdua A, Morimoto E, Anders MW, and Endou H (2002) Transport of amino acid-related compounds mediated by l-type amino acid transporter 1 (LAT1): insights into the mechanisms of substrate recognition. Mol Pharmacol 61: 729-737. Wang H, Huang W, Fei YJ, Xia H, Yang-Feng TL, Leibach FH, Devoe LD, Ganapathy V, and Prasad PD (1999) Human placental Na+-dependent multivitamin transporter: cloning, functional expression, gene structure and chromosomal localization. J Biol Chem 274: 14875-14883.